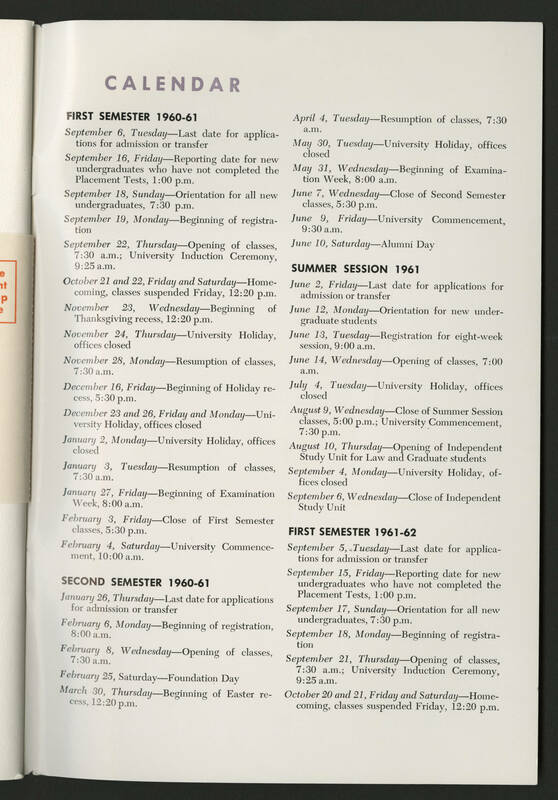 CALENDAR FIRST SEMESTER 1960-61 September 6, Tuesday - Last date for applications for admission or transfer. September 16, Friday- Reporting date for new undergraduates who have not completed the Placement tests 1:00 p.m. September 18 Sunday - Orientation for all new undergraduates 7:30 p.m. September 19, Monday - Beginning of Registration September 22, Thursday -Opening of classes 7:30 a.m.; University Induction Ceremony, 9:25 a.m. October 21 and 22 Friday and Saturday- Homecoming, classes suspended Friday 12:20 p.m. November 23, Wednesday - Beginning of Thanksgiving recess 12:20 p.m. November 24, Thursday - University Holiday, offices closed November 28, Monday - Resumption of classes 7:30 a.m. December 16, Friday - Beginning of Holiday recess 5:30 p.m. December 23 and 26, Friday and Monday - University Holiday, offices closed January 2 Monday - University Holiday offices closed January 3, Tuesday - Resumption of classes 7:30 a.m. January 27, Friday - Beginning of Examination Week 8:00 a.m. February 3 Friday - Close of First Semester classes 5:30 p.m. February 4, Saturday - University Commencement 10:00 a.m. SECOND SEMESTER 1960-61 January 26, Thursday - Lasst date for applications for admission or transfer February 6, Monday - Beginning of registration 8:00 a.m. February 8, Wednesday - Opening of classes 7:30 a.m. February 25, Saturday - Foundation Day March 30, Thursday - Beginning of Easter recess 12:20p.m. April 4 Tuesday - Resumption of classes, 7:30 a.m. May 30, Tuesday - University Holiday, offices closed May 31, Wednesday - Beginning of Examination Week 8:00 a.m. June 7 Wednesday - Close of Second Semester classes 5:30 p.m. June 9, Friday - University Commencement 9:30 a.m. June 10 Saturday- Alumni Day SUMMER SESSION 1961 June 2, Friday - Last date for applications for admission or transfer June 12, Monday - Orientation for new undergraduate students June 13, Tuesday - Registration for eight week session 9:00 a.m. June 14, Wednesday - Opening of classes 7:00 a.m. July 4, Tuesday - University Holiday, offices closed August 9, Wednesday - Close of Summer Session classes 5:00 p.m. University Commencement, 7:30 p,m, August 10, Thursday - Opening of Independent Study Unit for Law and Graduate Students September 4 , Monday - University Holiday, offices closed September 6, Wednesday - Close of Independent Study Unit. FIRST SEMESTER 1961-62 September 5, Tuesday - Last date for applications for admission or transfer September 15, Friday - Reporting date for new undergraduates who have not completed the Placement Tests 1:00 p.m. September 17, Sunday- Orientation for all new undergraduates, 7:30 p.m. September 18, Monday - Beginning of registration September 21, Thursday - Opening of classes, 7:30 a.m. University Induction Ceremony 9:25 a.m. October 20 and 21 Friday and Saturday - Home coming , classes suspended Friday, 12:20 p.m.